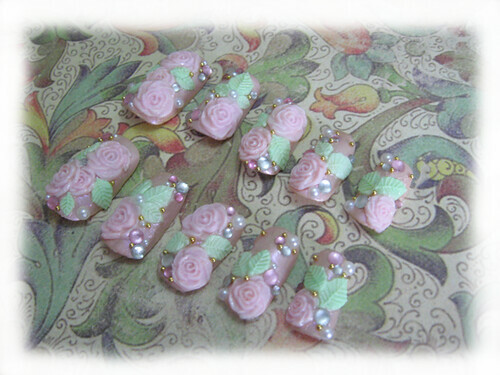 I had finished both of my nail sets earlier last week, but I wanted to wait to take pictures of them being wore for the cherry blossom festival. Unfortunately yesterday was an eventful day, I forgot my camera, and I took the nails off before bed. At least I can post the pictures I took of the full set. What do you think? I think they are so feminine and hime. Disclaimer: The design is not originally mine. I saw a nail set like this online ages ago from a Japanese website. Those are just amazing! Cute and very well done! The nails truly look gorgeous and pretty. You did a fantastic job with them! :D Could it be possible that the website that you saw the design on is fullmoon? Just out of curiosity and I did happen to see some designs that are similar to the nail design that you had mentioned. Lavenrose: The nails on that website are beautiful! But that was not the website I found the design from. It was an actual Japanese nail salon. It had a huge gallery of different styles. I do not remember the name.